This article explains vendor stickiness concept and provides information about how to override the default behaviour. 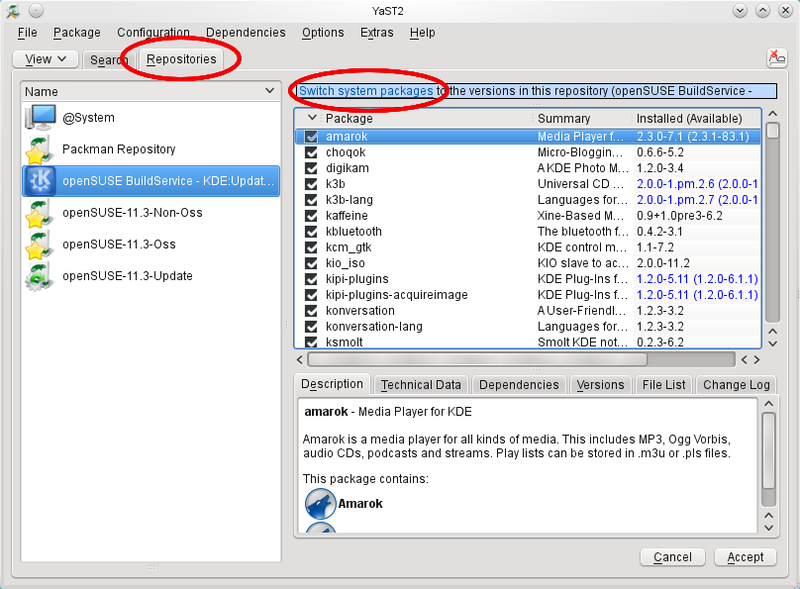 Version: 11.2+ The following applies to openSUSE starting from 11.2 release. The package manager Zypp uses the vendor stickyness concept. This means that when you update your system, already installed packages will not be updated to a newer version, if the newer version is provided by a different vendor. You don't risk accidentally replacing stable versions of installed packages with experimental versions from a different repository when updating. You won't risk packages ping-ponging between different repositories every time you update, when the same package exists in more than one repository. Now and then the package manager will ask you if you want to allow vendor change, which can be annoying, scary or confusing. These are the different methods you can use to perform vendor change updates. Search for the package you want to update, and then go to the Versions tab and select the version you want to install. You can find the vendor with YaST ("Versions" tab) or the command line "zypper if <package>". You can use any file name, but each file in this directory reflects a group of equivalent vendors. Libzypp makes an string comparision (like strncmp, case-insensitive) whereas the beginning of the strings are compared only.e.G. vendor "opensuse11.0" is compatible to "openSUSE". If you wish you can disable vendor stickyness completely - in this case the package manager will not ask permission to change vendor for packages, and updating will just install whatever package has the highest version number, regardless of where it comes from. Now zypper up will install the newest versions available from any vendor. 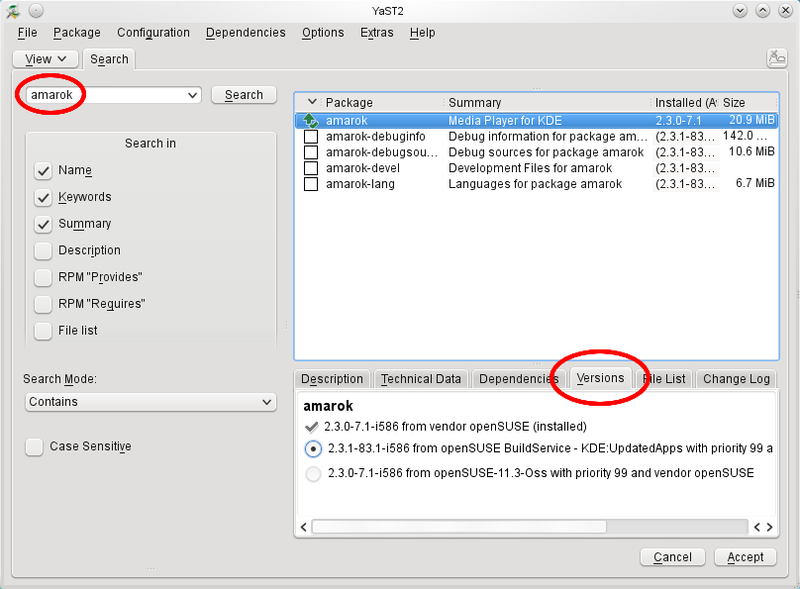 And YaST will mark packages where an update is available with blue text, even if the update is from a different vendor. This page was last modified on 4 January 2016, at 22:30.